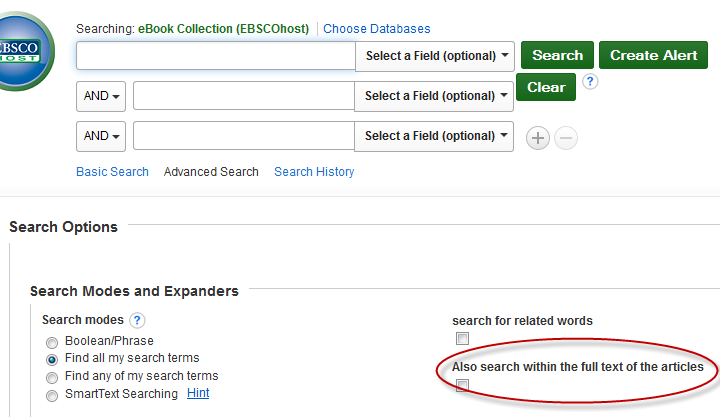 If you're having trouble finding a information on an arcane topic, try using the Advanced Search option in EBSCO eBooks. With over 60,000 titles, EBSCO eBooks has information on countless topics. In Advanced Search, select Also search within the full text of the articles in order to search for words within the entire eBook collection. You will find mentions of a term--even if it's not the main topic of the book--within chapters, sections, and paragraphs. When you have a hard-to-find topic, this feature lets you thumb through thousands of books to find relevant passages. Other Advanced Search options let you look for related words or limit your search to certain languages.